Happy Friday eve babes! This week has been SO insane and I apologize for the lack of new content around these parts. Between adding another human to the family, trying to work, keeping the house clean, trying to sell our house in Georgia and battling a round of fleas, I’m exhausted. The baby has been up every 4 hours the past couple of nights and I got a little spoiled after having her sleep 7-8 hours a night. But I’m taking it day by day and doing the best I can. That’s all you can do when life gets crazy, right? The weather has finally cooled down a little with days in the mid 70s. Which is warmer than I’d like it right now but I know we’re slowly working our way towards full-time fall weather. I’m hoping to make it to some fall-ish things this weekend if the weather cooperates! Fall is my absolute favorite season for so many reasons but mostly because I LOVE fall fashion. 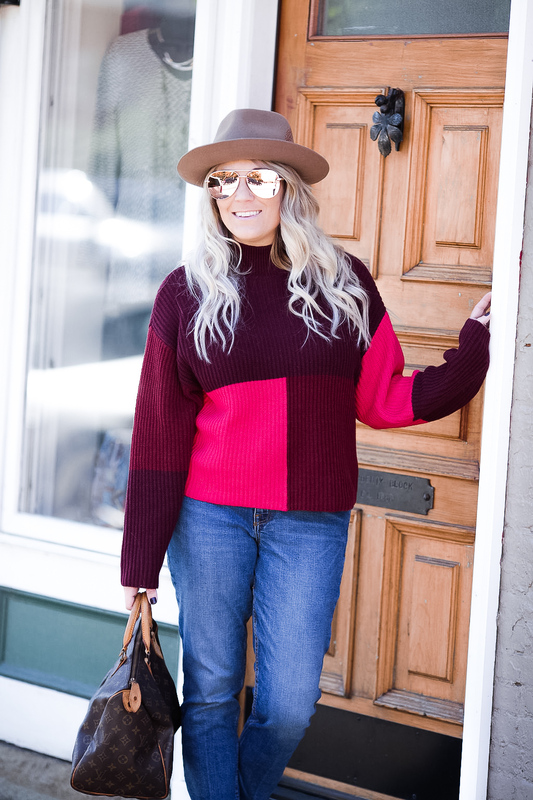 When I saw that neons and colorblock pieces were going to be big this fall, I was super excited to find some sweaters that allowed me to rock both of these of trends. 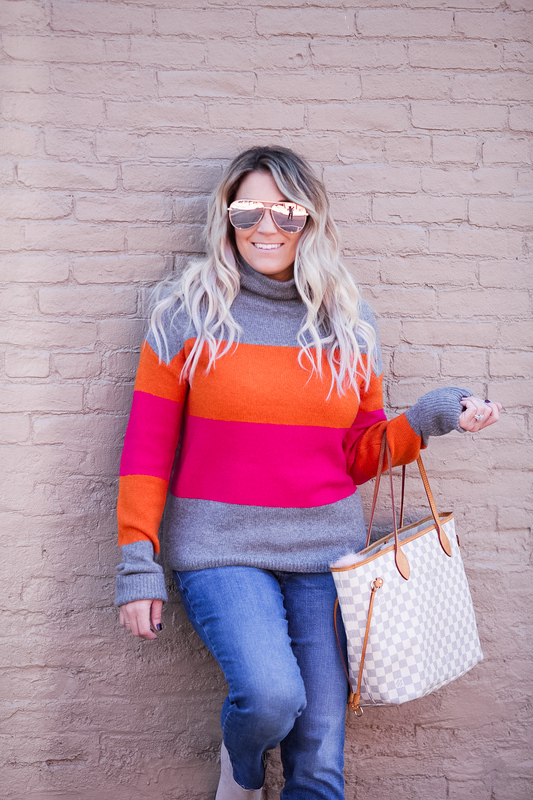 And while neons aren’t typically what you envision when you think of fall, the style Gods say it’s trendy so we’re going to give it a try and roll with it! I found these booties a few weeks ago and they were 40% off so I grabbed them in two colors! But they have a ton more options online and these babies can be worn all the way to spring! I also bought my first pair of non-maternity jeans but I will say, I’m not super sold on them yet. They fit around the waist but they become baggy everywhere else after wearing all day. I would suggest sizing down if you can or putting them in the dryer! One of the sweaters above is sold out and the other is only available in select sizes, but don’t worry! 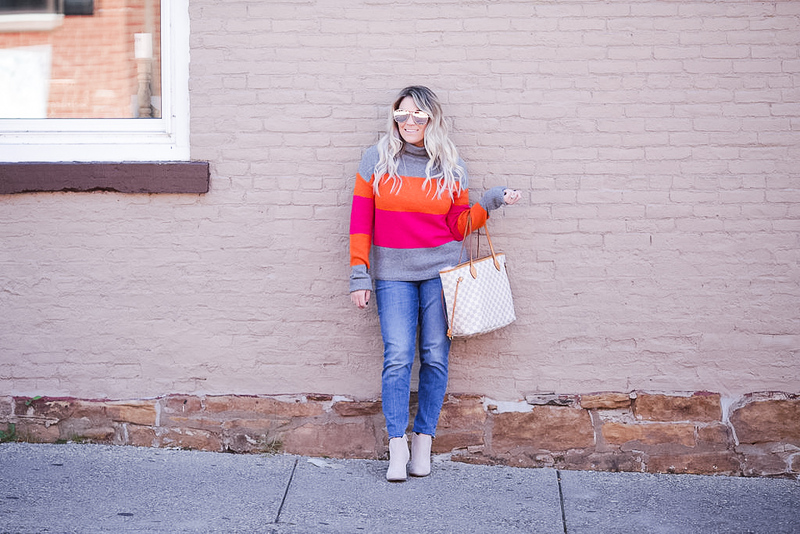 I rounded up a ton of colorblock sweaters I’m swooning over and adding to my cart! You can never have too many sweaters, right? 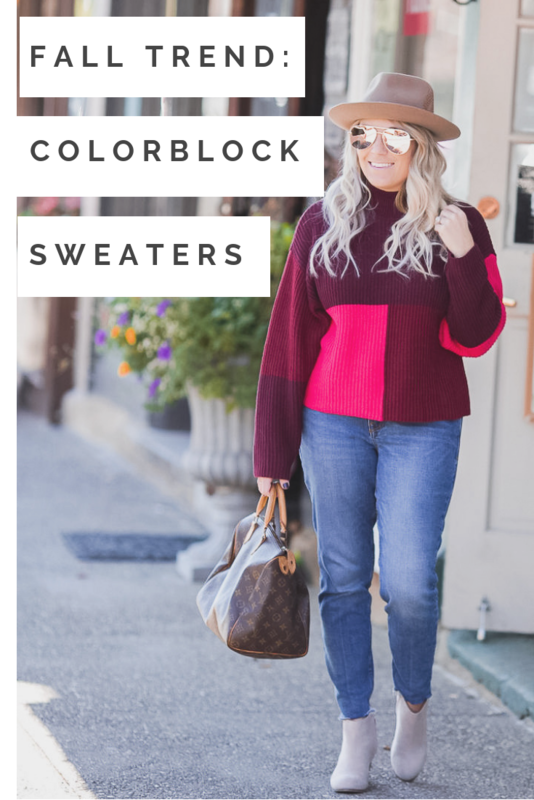 What do you think of the colorblock sweater trend? I am loving all of these picks!!! We are finally supposed to get cooler weather next week and I am absolutely excited about it! I have purchased so many new Fall clothes so I am ready to bust those bad boys out. Loving both of these sweaters! Something different – I usually go so neutral this time of year so it’s fun to see these new trends! Love these sweaters! I’m really into cozy knits right now.